Kershaw Leeks have been top sellers since they were first introduced. But because they're so popular, lots of people want a Leek they can call their own - in a color or finish they really like. So we're happy to introduce a brand new color so that you can have the Leek you've always wanted. This one is a bright teal. 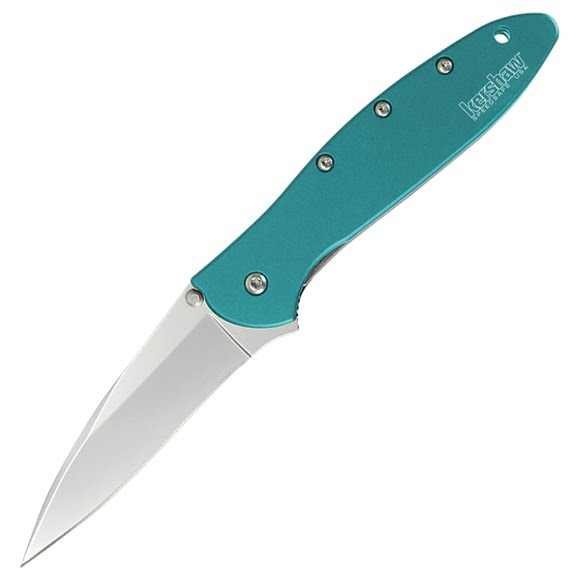 Kershaw Leeks have been top sellers since they were first introduced. But because they&apos;re so popular, lots of people want a Leek they can call their own - in a color or finish they really like. So we&apos;re happy to introduce a brand new color so that you can have the Leek you&apos;ve always wanted. This one is a bright teal. The brilliant color is applied to the anodized aluminum handle. The color is a fade-resistant, scratch-resistant dye that&apos;s permanently bonded to the aluminum, so it looks good now, and looks good later, too. But color isn&apos;t the only benefit of anodizing; the process strengthens the aluminum as well.